The 1984 Thames TV adaptation of Chocky is now on YouTube: http://www.youtube.com/watch?v=4kP6xJC_MiY You can also get it on DVD, together with its two sequels (Although the sequels are rather poor imitations in my view). I remember as a child watching this avidly. I found it creepy, exciting and very absorbing, but in those days I didn't understand the themes of the story. Today I do. The TV series is adapted from the last novel by John Wyndham, published in 1968, the year before the author’s death. This is the famous British sci-fi writer who wrote many very insightful and chilling tales of otherworldly matters. Like Day of the Triffids, about giant alien carnivorous plants. He also wrote a terrifying novel about alien-human hybridization called The Midwich Cuckoos. Chocky is the story of an ordinary 12-year-old schoolboy called Matthew who is one day contacted psychically by an intelligence from another world, either an alien planet or dimension. The plot vaguely resembles that of the film Harvey which I’ve written about before (http://hpanwo.blogspot.com/2008/03/imaginary-friends.html), but Chocky is not a comedy and is far less light-hearted. It is actually quite disturbing. Matthew’s parents are not initially concerned, thinking that it’s just a childhood imaginary friend; although Matthew is slightly old for one, they assume it’s a brief phase. But as time goes on they realize that Matthew is picking up knowledge and developing skills that he could not possibly have learned at school. The knowledge transfer is two-way; the alien entity has an equally voracious curiosity about the Earth and humans. Matthew’s telepathic encounters eventually get him and his family into trouble. He is taken into the care of psychiatrists and the family find themselves shadowed by undercover government officials, rather like the Men-in-Black. When I watched it as a child I didn’t know what I do now: That the story of Chocky is very similar to real events. 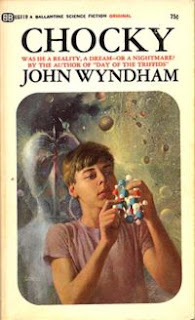 I wonder how much John Wyndham really knew. Did he have access to people and information that he hasn’t revealed? There are real people who’ve had experiences just like Matthew’s. I’ve read true-life books by them and even met a few of them. Somewhere “out there” in space or even hyperspace, there are conscious beings that are able to communicate with Earth humans and even visit them! Some of these cases are even more bizarre and disquieting that Matthew’s. Matthew is not “possessed” in the sense of a demonic walk-in. He is able to control the alien’s access to his mind and eventually develops a friendly working relationship with it. Real encounters are often far more violent and damaging. Interest and obtrusion by government agencies is another aspect to these encounters that happens in real events too. I strongly recommend this excellent TV series to anyone with an interest in aliens, UFO’s, ghosts, channeling or abductions. I’ve never read the book, but I’ll have to get hold of the copy and read it. Back online, back in a house made of bricks, back in the civilised world. Great to see you are still blogging. E-mail me for a catch up, Dan. Hi, Dan. How's it going, Brother Porter? I'll be in touch. The Cover looks like Matthew is just about to spark up a crack pipe. Where you really a child when you watched it? Golly have you been ill? What do you mean by "was I ill", SW?